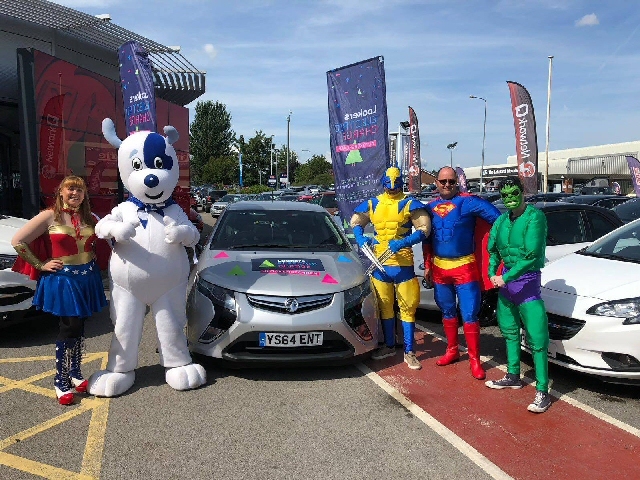 NATIONAL motor retailer Lookers has taken on the Merseyside leg of the biggest charity drive in its history, the Lookers Electric Charge. The carbon neutral challenge, which is in aid of industry charity Ben, sees a relay of electric and hybrid vehicles travel 2,000 miles to destinations including all 154 of the retailer's franchised dealerships, where a range of fundraising events are being held. In Merseyside these have included bake sales and raffles, while, on the stranger end of the spectrum, staff have driven their electric vehicles dressed as super heroes, at Vauxhall Ellesmere Port to the Teletubbies at Vauxhall St. Helens, all while singing the challenge's theme song Electric Avenue to camera. The electric car relay will take in all 25 of Lookers' North West dealerships before making its way to its sites in Staffordshire. The initiative will include over 180 stops in total, including visits to the Electrification Centre of Excellence, at the Jaguar Visitor Centre, in Castle Bromwich and Ford's iconic factory, in Dagenham. While in London, the Electric Charge will also hold the ultimate showdown between electric car and bike in a 1st to the finish race across the City. Lookers CEO Andy Bruce said:- "We've seen a number of fantastic fundraising events held at our dealerships in Ireland, Scotland, the North East and Yorkshire in support of the Lookers Electric Charge and I'm delighted to say that our teams in the North West have not let us down, with some really creative fund raising ideas on show." Zara Ross, Chief Executive at Ben said:- "We have been following the Lookers Electric Charge with great interest and have been amazed by the levels of creativity shown at each dealership along the route. Staff in Merseyside have all embraced this challenge, with some weird and wonderful fund raising events held. We can't wait to see what the challenge has in store as it continues down the country." You can follow all the action from the Lookers Electric Charge on the Lookers YouTube Channel LookersWebTV. A clinician with Lancashire Care NHS Foundation Trust has led on putting together new national guidelines to support people who suffer pain. Dr Chris Barker, Clinical Lead at Lancashire Care NHS Foundation Trust's Community Pain Service in Southport and Formby and chair of the CRPS Guideline Development Panel, has played an instrumental role in bringing together a UK panel of experts representing a variety of healthcare specialists and professions in coming up with the new guidelines. The 28 member panel was established by Dr Barker and Dr Andreas Goebel, consultant and senior lecturer in Pain Medicine at The Walton Centre NHS Foundation Trust. 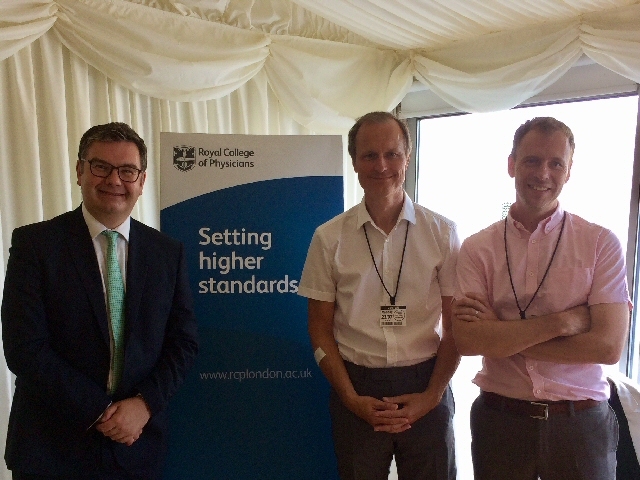 According to the guidelines, which were published on 23 July 2018, by the Royal College of Physicians, at an event held at the House of Commons, patients with complex regional pain syndrome (CRPS) need better diagnosis, treatment and management of their condition from a wide variety of healthcare professionals. Dr Chris Barker, Clinical Lead at Lancashire Care NHS Foundation Trust's Community Pain Service, said:- "We're so delighted to have launched these guidelines that are supported by a range of organisations and we're confident that they will help to ensure coherent, transparent, and safe care for patients with this often very painful condition. These guidelines help to raise the profile of CRPS and provide an excellent evidence-based framework to support healthcare professionals in delivering timely and appropriate care." The guidelines, entitled:- "Complex regional pain syndrome in adults:- UK guidelines for diagnosis, referral and management in primary and secondary care" - provides guidance on diagnosis, treatment, management and support for patients in a wide variety of clinical settings. The launch event was also attended by MP for Milton Keynes South Iain Stewart, and supported by the Royal College of Physicians and patient charities the CRPS UK Clinical and Research Network and Burning Nights. The guidelines are available to download from the CRPS Network website.